Mihailo Petrović Alas was an inventor and influential Serbian mathematician. 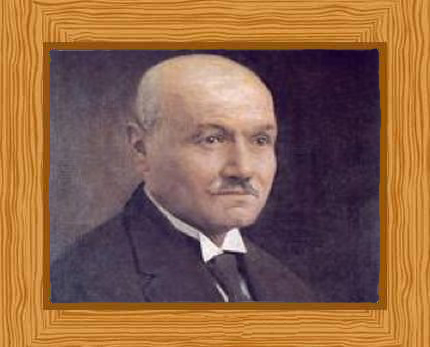 His main contributions were providing differential equations and several works on phenomenology. He was a well-respected professor at the Belgrade University and apart from his endeavors in mathematics, he was also a musician, publicist, businessman, writer, fisherman, and an academic. Aside from his most significant contributions in phenomenology and differential equations, he also helped in the development of the very first prototypes of the analog computer. Mihailo Petrović Alas was the firstborn of his father Nikodim who was a theology professor and his mother, Milica. Mihailo was born on the 6th of May in 1868 in Belgrade. After finishing his studies in the First Belgrade Gymnasium in 1885, he enrolled for courses in the Faculty of Philosophy in Belgrade, specifically for the natural sciences (physics, chemistry, geology, biology, psychology and philosophy) and mathematics. When he finished his scientific studies in Serbia in 1889 he strived to improve his knowledge further and in 1889, Petrović decided to pursue further studies abroad and he prepared for the entrance exam to the École Normale Supérieure, where scientific universality was strongly encouraged. In 1892, Petrović obtained his degree, completing courses in mathematical sciences and the following year received a degree in physics. Petrović was continuously improving his education and he obtained his doctorate in 1894 with a dissertation on differential equations. He received the title “Docteur des sciences mathematiques” or doctor of mathematical sciences. Having acquired this background, as well as some training for more intensive work, Petrović became one of the professors of mathematics at what is now known as the University of Belgrade in 1894. Petrović had the greatest mind for differential equations, lecturing on mathematics and equations up to his retirement in 1938, a lengthy 44 years of service. He was only 31 when he became a full member of the Serbian Royal Academy, and additionally, he became an associate member of the Zagreb’s Yugoslav Academy of Sciences and Arts. In the 1890’s he developed the hydraulic computer for the solution of first order ordinary differential equations. Called the hydraulic integrator, the machine was displayed at the World Exposition in Paris in 1900 where he received a gold medal. Petrović published many journals, scientific works, and books, as well as writings on his inventions during his lifetime. He was very interested in fishery and made notes of his sea expeditions. Because of his academic work and outstanding publications, he was recognized by many different academies and societies with acknowledgements and awards. When Jovan Cvijic, president of the Royal Serbian Academy, died in 1927, many members suggested that Petrović should be president. Higher authorities however did not accept the proposal, the reason being that Petrović was a very close friend of the king’s brother who had been under house arrested since 1925. In 1931, members of the academy again proposed for Petrović to be elected as their president, but this was dismissed again. Bogdan Gavrilovic, a fellow professor and mathematician, was nominated as the president instead. Because of his contributions and help in different academic endeavors, Petrović became one of the honorary doctors of the University of Belgrade in 1939 and that same year he received the first class order of Saint Sava. Given his expertise and knowledge in the field of mathematics, he founded the Belgrade School of Mathematics. As the years passed, this very school was responsible for producing a number of excellent mathematicians who continued his works. Petrović was a man of many trades and was also involved in services for his country. He fought in the Balkan Wars and was an officer during the First World War. He practiced cryptography and the cipher systems he developed where used by the Yugoslav army up until the Second World War. During the Second World War, he was again called to service, and this time, he was captured by the Germans. Fortunately, he was later released because of illness. On 8 June in 1943 Mihailo Petrović Alas died at the age of 75 in his own home in Belgrade. His nickname “Alas” was drawn from his love of fishery which means “river fisherman.” He became a fisherman’s apprentice in 1882, and in 1895 he took the exam to be a master fisherman. So much was his love for fishery that he participated in some legislative talks about fishery protection the Drina, Danube, and the Sava rivers. Apart from his interests in academics and fishery, he was also a musician, playing the violin and he founded a musical society called “Suz”. He was also a passionate traveler and his wanderlust took him to both the South and North poles. Petrović gained international recognition and was a member of societies in Paris, Prague, France, and Berlin, and was a member of different academies in Bucharest, Warsaw, and Krakow. He was a member of SANU, the Academy of Sciences of the Czech Republic, and the Yugoslav academy where he helped hone the young minds of aspiring mathematicians and scholars of his age.